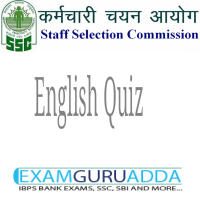 Dear Readers, Practice English Quiz for SSC Mains, CHSL. Directions(Q1-10): Select the word having the same meaning as the given word. Sol. Vituperation- bitter and abusive language. Sol. Repeal-revoke or annul (a law or act of parliament)., abrogation-the repeal or abolition of a law, right, or agreement. Sol. Qualm -an uneasy feeling of doubt, worry, or fear, especially about one's own conduct; a misgiving. Sol. Polemic-a strong verbal or written attack on someone or something. Sol. Elation -great happiness and exhilaration. Sol. Apportionment -the action or result of apportioning something. Sol. Vaunt -boast about or praise (something), especially excessively. Sol. Equivocal -open to more than one interpretation; ambiguous. Sol. Fetid -smelling extremely unpleasant.